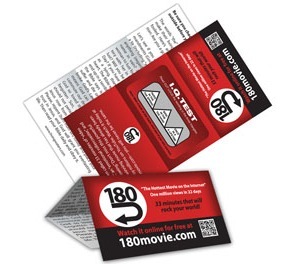 This tract has an IQ test that transitions into the gospel as well as directing people to visit 180movie.com to freely view the documentary. Magicians make their living off the fact that we are easily fooled. Here’s another thought-provoking question: Are you a good person? 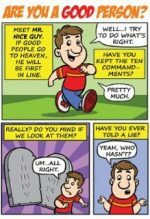 Let’s see if you are, by looking at the Ten Commandments (God’s moral Law). Have you ever told a lie (including “white” lies, half-truths, etc. ), stolen anything (regardless of its value), or used God’s name in vain? Jesus said, “Whoever looks at a woman to lust for her has already committed adultery with her in his heart.” Have you looked with lust? Will you be innocent or guilty on Judgment Day? If you have done those things, God sees you as a lying, thieving, blasphemous adulterer at heart. The Bible warns that if you are guilty you will end up in a terrible place called “Hell.” But God, who the Bible says is “rich in mercy,” sent His Son to suffer and die on the cross for guilty sinners. We broke God’s Law, but Jesus paid our fine. That means God can legally dismiss our case. He can commute our death sentence and let us live: “For God so loved the world that He gave His only begotten Son, that whoever believes in Him should not perish but have everlasting life.” Then Jesus rose from the dead and defeated death. Please, repent (turn from sin) today and place your trust in Jesus, and God will grant you everlasting life. Then read your Bible daily and obey it. Be the first to review ““180” Fold-out Tract (100pk)” Click here to cancel reply.